This is my second IndigoBlu project. Ever since I can remember I have been fascinated by clocks probably something to do with the fact that as a child I spent hours watching my dear Taid (Welsh for Grandfather) pulling clocks apart and then putting them back together again. So when Kay Halliwell Sutton launched this clock kit at the CHA in America I was thrilled at the idea that I could make my own clock ... and here it is...not perfect but all my own work and it keeps good time. The demo Kay did was excellent she explained that it was well worth making cardboard templates for positioning the figures and the rings and this did make everything so much easier. Having primed the MDF cog with gessso and painted it with acrylic paint, the fun bit was the actual stamping. The rose and the cogs were stamped first and having masked them I drew the inner rings in place with a fineline marker. The Roman Numerals for 12 , 6, 3 & 9 were stamped with IndigoBlu Flitter glue and gilding flakes applied ...it looked a bit of a mess until I buffed off the final bits of flake and then wow what a buzz !! finally added the marker stamp instead of the other figures and a bit of stamping with the crackle stamp. 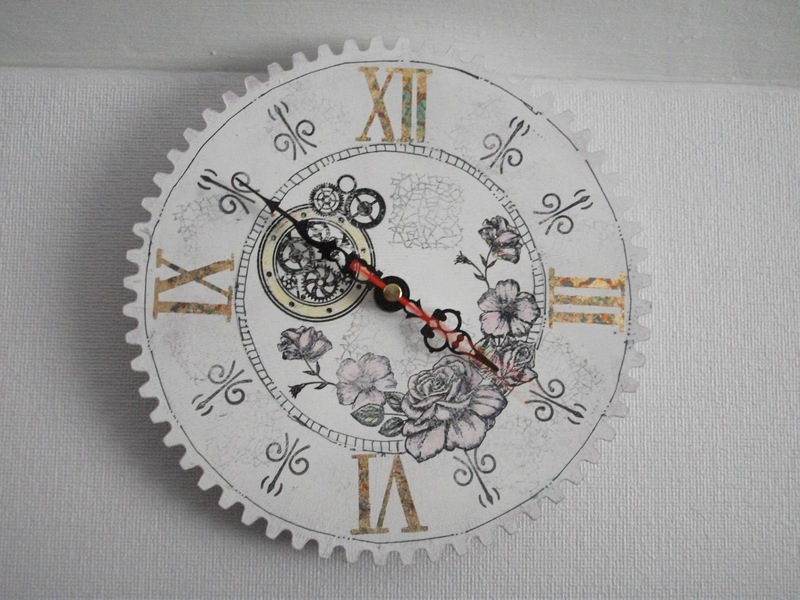 Then added the mechanism, fingers & batteries and I had my own clock. I have to admit this has been one of the most satisfying projects to do and it is much easier than it looks.